The Census Bureau’s recent report on characteristics of newly built housing reveals lots of interesting regional variations, beyond the widely reported fact that median square footage of single-family homes has resumed its pre-housing crash climb. For one, housing hasn’t grown evenly in all regions of the country. New homes are largest in the South, where the median floor area last year was 2,469 square feet; they’re smallest in the Midwest, at a median 2,177 square feet. (The median for the whole country is 2,384 square feet.) But over the past four decades, home size has grown the most in the Northeast: The median floor area of a new home there was 61% above the corresponding median in 1973. Last year, according to the Census data, fully a third of all newly completed houses in the South were 3,000 square feet or more; in 1999, which is as far back as the report goes, just 18% of new Southern homes were that big. If you’re looking for a new home with four or more bedrooms, you’re most likely to find one in the West or the South: 48% and 47%, respectively, of single-family homes completed last year in those regions have at least four bedrooms. The South also leads in share of new homes with three or more bathrooms: 36% last year. Homebuyers, or at least homebuilders, also show distinct regional preferences in 0utdoor amenities. 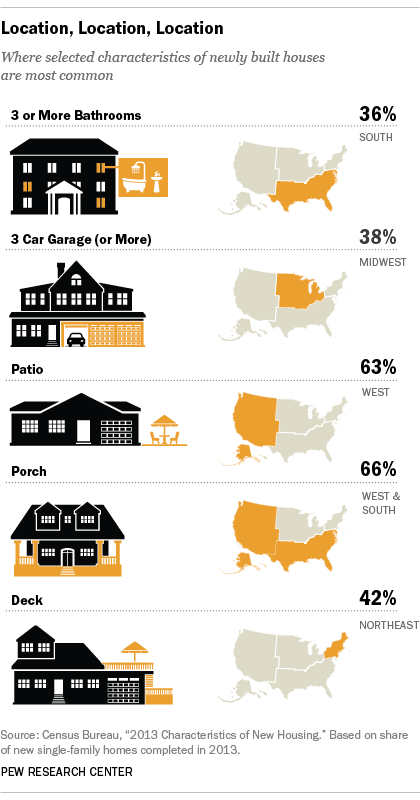 Two-thirds of all new-in-2013 houses in the West and South have porches; nearly that many (63%) in the West have patios. But decks were most common in the Northeast: 42% of new homes there have decks, nearly twice the national average.